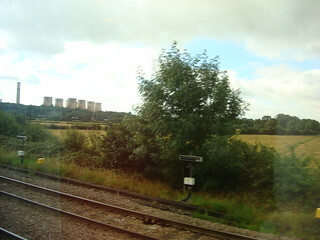 Parting Shot: on the last East Midlands Trains leg of the holiday, I finally grabbed this shot of Ratcliffe-on-Soar power station, having missed similar shots earlier in the holiday. Following the grand finale (our visit to Lincoln), Thursday (August 17th) was the end of our stay in Leicester. Our return to Wales would be the reverse of our outward journey; retracing our steps to Whitland. Thus, we boarded a Meridian (222023 on this occasion) at Leicester to take us to Derby for onward travel by one of the rare CrossCountry Intercity 125s. 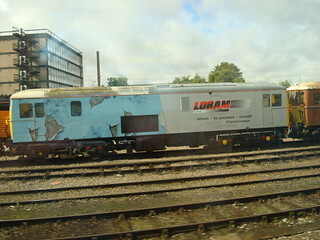 Painted Peels: another locomotive spotted from our train to Derby was this class 73 with artificial weathering. On the way to Derby we overtook a bright yellow train; a Network Rail track machine of some kind, hauled by a blue locomotive. I had a faint hope that it would catch us up during our near half-hour wait at Derby and fortunately it did, allowing me to see that the loco was 50008 ‘Thunderer’. 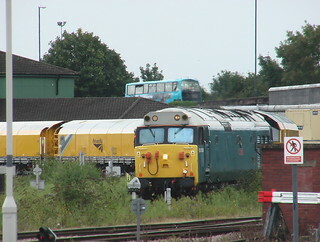 A class 50 in use on the modern railway was a nice surprise and really unexpected. It came to a stand just short of the station, then a few minutes later ran through light engine leaving the track machine behind. It was only then that I was able to read the loco’s number, but the track machine remained a mystery at that point. Thunder And Grinding: ‘Thunderer’ with the rail-grinder before the loco moved off alone. An hour after our scheduled departure from Leicester, we seated ourselves on the 10:30 CrossCountry departure from Derby (bound for Plymouth), led by 43304. As we headed south, I was finally able to identify the yellow machine the class 50 had brought to Derby as a rail grinding train. Our reserved seats were, as we had been told, at a table but they were facing backwards (we had been told otherwise). I’m guessing therefore that the train was the wrong way round, unless the route involves a reversal somewhere. The man opposite us kindly moved elsewhere so that we could face forward, but CrossCountry’s dreaded ‘reservable on-route’ policy forced us back into our reserved seats at Birmingham. Before that, an interesting sighting was a Travelodge in Burton-On-Trent, housed in a former Midland Railway Grain Warehouse (or so the writing on the wall declared). A rather more sombre observation was two Eurostar (class 373) power cars with parts of their sides missing; probably in the process of being scrapped. At the time, I did wonder whether they could be the two power cars being refurbished for display at the national college for high-speed rail, but I think it more likely that the ones I saw were practically on the scrapheap. For the record, the rear power car for our ride south was 43357. I saw this once we had alighted at Bristol Parkway, where I had planned a much shorter wait (11 minutes) than on our outward journey. The same-platform connection into the 12:42 service (bound for Cardiff with 43134 on the front and 43155 ‘The Red Arrows 50 Seasons Of Excellence’ bringing up the rear) went smoothly enough. Table bays aligned with the windows are almost like hen’s teeth on Great Western IC125s so we resorted to airline-style seating but at least I had room for my legs as the overhead racks took my suitcase. At Newport, the guard made an announcement advising passengers for stations beyond Cardiff Central to change at the latter (avoiding the need to change platforms, which would have been necessary had we changed at Newport). At the time, I agreed with that advise given the time of day. Later on, although Cardiff Central is generally much nicer than Newport station, I would have to advise changing at the latter for Pembrokeshire stations as in my experience the late-afternoon services to Pembrokeshire normally depart Cardiff full and standing. Anyway, I had planned to catch the 13:49 service from Cardiff Central, bound for Milford Haven; assuming it wouldn’t be busy at that time of day. Big mistake. During the scheduled 17 minute wait in Cardiff, I slipped into not really paying attention and was rather taken by surprise as our train rolled into the platform. By the time I reached the train, a class 175/0 (2-car) which had stopped a fair distance along the platform, it looked like pretty much all the seats were taken with a small number of passengers still in the queue to board. Made it at last: 43191 on the rear of the train that eventually brought us to Swansea. Not so much a welcome, really. Over five days* of travelling on East Midlands Trains, London Midland and Northern services, and even CrossCountry Turbostars, we had little trouble finding a seat. But now? We had come almost within two hours of Whitland and were crowded out. It seems that two carriages is not enough on a fast train between Cardiff and Swansea, even at off-peak times. 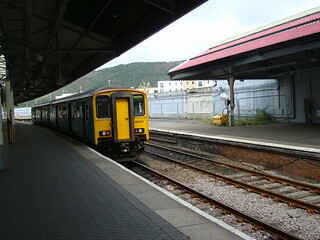 Sorry Sight: 150241 waits at Swansea with the Pembroke Dock service we would be catching. Swansea to Pembroke Dock is a long way to go on one of these uncomfortable Sprinters. A GWR train to Swansea was due ten minutes later, so we waited for that. 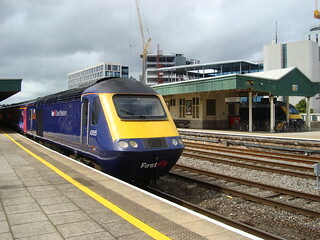 43122 on the front and 43191 on the back, due into Swansea at 14:46. While there, a Manchester to Carmarthen service passed through; we could have taken that to get closer to home but in the hope of seeing 43002 and 43185 again I opted to wait until the 16:00 Swansea to Pembroke Dock service (which we would have had to wait for at Carmarthen anyway). 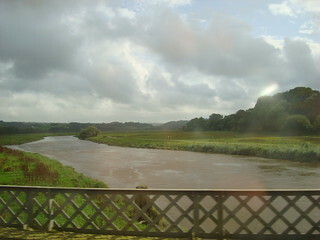 A Bridge Too Far: this shot was taken from ‘our’ train as it crossed the river Towy just after the call at Carmarthen. In my opinion, a class 150 is so uncomfortable they should be limited to services of under an hour in duration; Swansea to Carmarthen is right on the limit. After the next train from London had arrived (not with heritage power cars) we boarded the final train of our trip; 150241. I think the overhead racks must have taken my suitcase on this too, as I don’t remember having it squashed against my legs. Unlike on the Great Western services however, getting my case up out-of-the-way is not sufficient to make room for my legs. A class 150 simply does not provide the necessary legroom in the airline-style seats and the table bays are few in number and not aligned with the windows. Oh well, I was getting off at Whitland anyway; at least I didn’t have to go all the way to Pembroke Dock on the thing. Previous PostEast Midlands FinaleNext PostFreedom Of Movement? Rhydgaled on LLAnBranches – Going West? Steve Forde on LLAnBranches – Going West?